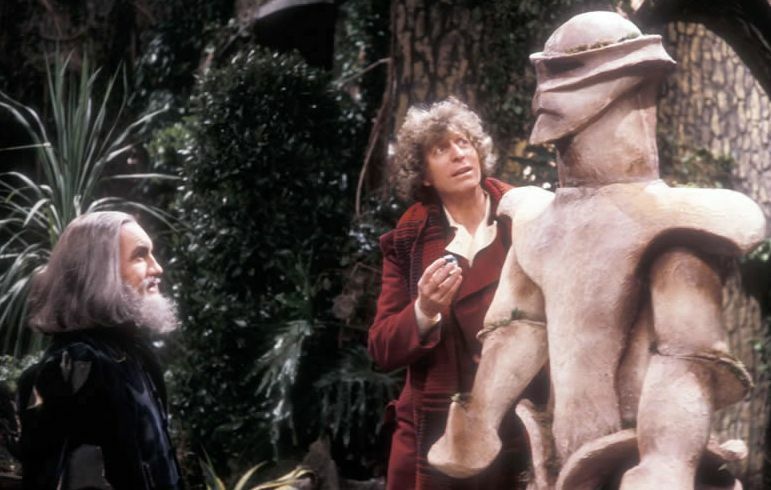 Although some may view The Keeper of Traken as simply a prelude to Logopolis and the confrontation between the Doctor and the Master, there’s enough of interest in Johnny Byrne’s story to ensure it’s a good yarn in its own right. Like the majority of S18, Traken was subject to a heavy re-write by Christopher H. Bidmead (and I do like the theory that later script editor Eric Saward was unaware of this and wondered why Byrne’s subsequent stories lacked the quality of this one). One notable amendment was the revelation that Melkur was actually the Master, although this doesn’t really affect the story too much as it’s only discovered at the end of the story. Indeed, if you view Traken as a Master story then you could come away disastisifed, despite Geoffrey Beever’s brief but impressive turn. DOCTOR: Oh, he’s not local. E-space, wasn’t it? KEEPER: How vain one can be. I thought the whole universe knew the history of our little empire. DOCTOR: Yes. They say the atmosphere there was so full of goodness that evil just shriveled up and died. Maybe that’s why I never went there. We’ve been here before, as this seems like how the Conscience Machine operated in The Keys of Marinus. Presumably the Source Manipulator works in a similar way and it’s impossible not to conclude that it must somehow sap the will as a complete lack of anger or aggression doesn’t seem at all natural. In Marinus the Doctor concluded that human beings weren’t meant to be controlled by machines but there’s no such statement here as by the end of the story Luvic (from an increasingly short-list of possibilities) steps into the breach to maintain the status quo. 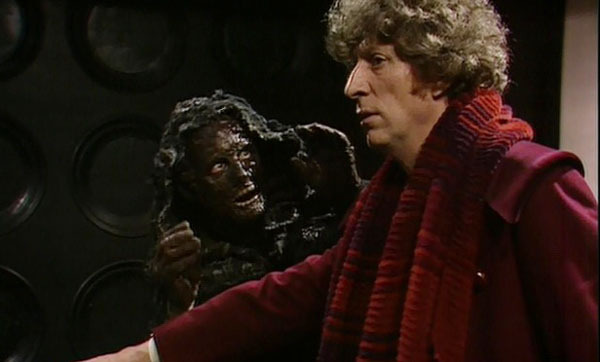 If the story has a feel of the Hartnell era, then the Shakespearean-style production design could be another nod to this. We don’t quite have characters speaking in iambic pentameter, as in The Crusade, but it’s close. Production-wise, Traken is a studio-bound world that looks somewhat artificial and theatrical although it’s possible to argue that this is intentional as maybe they were attempting to replicate the look of the then current BBC cycle of Shakespeare productions. Margot Van der Burgh (from The Aztecs) is another link back to the Hartnell era and she, like the rest of the cast, plays it dead straight – there’s no S17 goofing around here. Sheila Ruskin as the doomed Kassia is very good as is Anthony Ainley as Tremas. His performances as the Master can best be described as variable, but he’s restrained and subtle as Tremas. 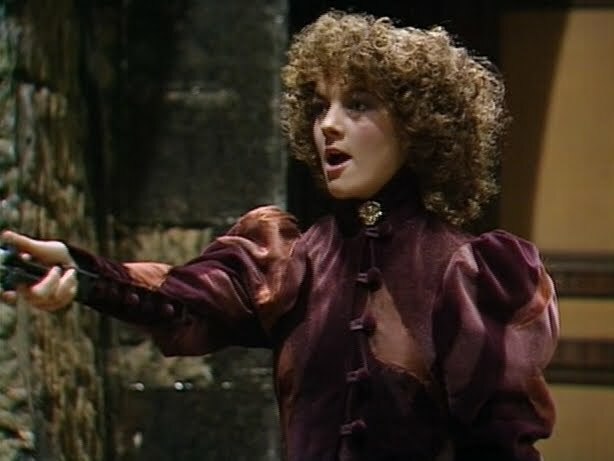 Sarah Sutton gives an acceptable performance as Nyssa, although you’d be hard pressed to predict that she’s automatic companion material, as plenty of one-off characters in the past have had much more potential. But there was clearly something in the scientific nature of Nyssa that caught the attention of both Bidmead and JNT. A pity, then, that incoming script editor Eric Saward would have much less interest in developing scientific themes, hence Nyssa would have a reduced role to play, particularly once Tegan was installed in the TARDIS.